Kochi: Chingom, the auspicious Malayalam month, has dawned marking the end of the cruel and harsh month of Karkidakam which brought misery by claiming hundreds of lives the State. True to belief, the first day of the month saw rain abating in many places, including the worst-hit areas of Pathanamthitta and Aluva. It is also signals beginning of the Malayalam New Year when marriages and other important events are held. Chingom when when the 10-day festival of Onam is celebrated. The first day of the Onam begins on Atham. Normally, temples are packed on this first day. But temples remained free from heavy rush today. Tirunakkara temple is one such shrine where large number of devotees turn up on normal days. The temple usually witnesses heavy inflow of Sabarimala pilgrims visiting the hill shrine for monthly pujas. The Pamba river is in spate and pilgrims are not allowed to visit Sabarimala. A few from Tamil Nadu were seen at Sri Krishnaswamy temple at Tirunakkara, hoping to proceed to the Pamba if water level drops. The month is believed to bring bounties to the people. But, this time it has opened the doors of tragedy and disasters. People are not even aware of the advent of the month as the flood continues to create havoc. While flood water continues to remain adamant not flowing back to the river, the stopping of rain has helped in making rescue operations more effective. Many people in less affected areas came out of their houses to recharge their supplies, fearing shortage of articles in the coming days in the event of rain starting once again. There were huge queues outside fuel station in non-flooded areas as people feared scarcity of oil due to inability of tankers to move through flooded areas. 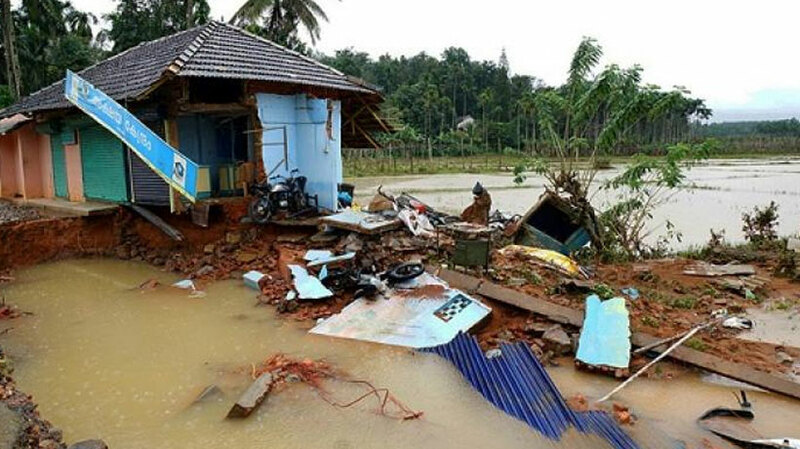 Many people remained indoors, fearing landslides and getting trapped in flood waters. Some districts, including Kasargod, Kottayam, Kollam and Thiruvananthapuram remained comparatively safe and less submerged. Vendors eagerly waited for buyers in Kottayam.